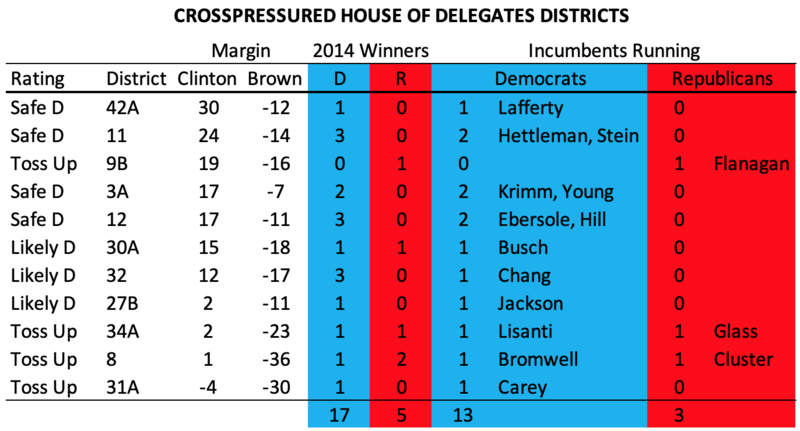 Any House of Delegates district that is crosspressured in the sense of having voted for Clinton in the 2016 presidential and for Hogan in the 2014 gubernatorial made this list. It additionally includes one district that elected a Democratic delegate in 2014 despite leaning Republican in these two contests. Nevertheless, in many ways, the House of Delegates races are less interesting than the Senate. Republicans correctly perceive their chances of obtaining a veto-sustaining minority as greater in the Senate than the House. Del. Robert Flanagan in District 9B is the most vulnerable Republican incumbent in either house of the General Assembly. While Hogan won his district by 16 in 2014, Clinton won it by 19 in 2016. This Howard district is exactly the type that is trending hard towards the Democrats due to its highly educated electorate. Even worse for Flanagan, his opponent is Courtney Watson. While Watson lost the county executive race to Allen Kittleman in 2014, she is a well-known and experienced candidate. Flanagan will need all the luck he can get to hang on to his seat. While Republican Glen Glass is likely safe in District 34A, any Democrat in Harford County always has to watch their back. Del. Mary Ann Lisanti who also represents 34A is no exception. The district, centered on Havre de Grace, went slightly for Clinton in 2016. The likelihood that Hogan will roll up an even greater margin than the 23 points he won in 2014 is no help to Lisanti. Still, she’s established and voters here clearly are used to splitting tickets. In east Baltimore County District 8, the Republicans are likely safe and looking to take sole Democrat Del. Eric Bromwell’s seat. But Bromwells have long been a strong candidate in this district and he may be a tad better positioned than Sen. Kathy Klausmeier. But Johnny Oleszewski’s family also had its own brand in neighboring District 6 before he lost in 2014. Bromwell came in third in 2014. While the best candidate that the Democrats could run, the question remains whether Bromwell can overcome a Hogan margin even more massive than the 36 points from 2014 in a district moving away from the Democrats. Seeking a second term, Del. Ned Carey already represents Republican territory in District 31A in Anne Arundel. It went for Trump over Clinton by 4 points and for Hogan over Brown by 30 points. I suppose the good news for him is that the Hogan margin was smaller than in Bromwell’s district. If he won this turf in tough 2014, Carey may be hard to dislodge in a more favorable 2018. Still, Carey won by just 52.6% in 2014, so has only a small cushion. Located just south of Baltimore City, the question is whether a less hellacious political climate can overcome an even larger margin for Hogan. In District 30, Speaker Busch is looking to pick up the seat being vacated for his long-time bête noire Herb McMillan. While the Republicans always look to take out Busch, the recent Democratic sweep in Annapolis bodes far better for a Democratic pickup than a surprise defeat of Maryland’s longest serving Speaker. I doubt Republicans will take out either Del. Michael Jackson in District 27B or pickup any of the three delegate seats in District 32, though Del. Michael Chang is the only incumbent running. Clinton won both districts by at least 12 points. Hogan’s margins will not be high enough to allow Republicans to capitalize on the gov’s success when split-ticket voting is rampant. It seems virtually impossible that the Democrats will lose seats in Districts 3A, 11, ,12 or 42A. Hillary Clinton won all of these districts by more than 17 points. Voters in these districts are happy to split their tickets in the gubernatorial but it won’t be enough to take out the Democratic delegate candidates. 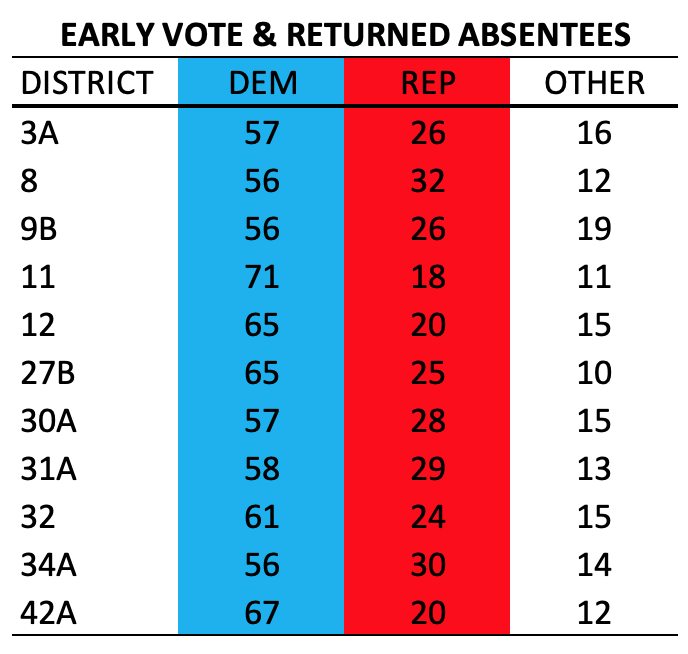 In District 3, Sen. Ron Young is endangered but District 3A excludes the most Republican turf. Dels. Carol Krimm and Karen Young should return to the House. In District 11, the Republicans are running only one candidate. Incumbents Shelly Hettleman and Dana Stein will be rejoined by Jon Cardin, who ran unsuccessfully for attorney general in 2014. District 12 contains much territory in Howard with many highly educated voters of the sort that are moving Democratic this year. There is little reason to think that the Republicans will close the substantial gap of several thousand votes from 2014. In any case, their top vote getter from that year is running for Senate. I expect Democratic Dels. Eric Ebersole and Terri Hill to be joined by Jessica Feldmark. Incumbent Stephen Lafferty did not run for Senate and instead chose to seek reelection in District 42A. While Hogan will carry this district, it is hard to imagine Republicans defeating Lafferty in a district that went for Clinton by 30 points. MD-03 is a tricky district. It has a Jackson Pollock quality in terms of it’s lines that really means no elected official has a true base here. It does take in enough prime political real estate that if John Sarbanes (still a young man) runs for his father’s US Senate seat one day – there should be a hard thought Democratic primary. It would not totally surprise me if Steve Silverman were interested in running for Congress, and he does indeed reside in the third district. He raised well over two million dollars in his bid for Montgomery County Exec in 2006. I doubt he could do half that for a Congressional campaign today. However, he’d have at least half a million at his disposal, and possibly seven or eight or nine hundred thousand. A few terms in Congress would surely be an enticing capstone to Ike Leggett’s career (And he too lives in MD-03). He could put together 1.5 to 2.5 million dollars and would be a strong candidate. Ike would be a real heavy weigh. . . and don’t we always say he’d be a better legislator? Anne Kaiser might clear a million dollars, but I’d be surprised. I wouldn’t be shocked if she had at least $700,000. I’d be blown away if she didn’t clear half a million. I suspect she’d get substantial help from national LGBT Donors and interests. Craig Zucker could do $250,000-$500,000. He’d also be dynamic enough to stretch those dollars. Craig might do well with SEIU (He ran there home care program in Maryland at one point) which could help substantially. Zucker is an incredibly hardworking candidate and could make himself competitive for the seat. Eric Luedtke is a lackluster fundraiser but could see substantial labor PAC money come to fund him. I’d also be a bit perplexed if the NEA didn’t spend hundreds of thousands in independent expenditure to support him, especially if Bill Ferguson were in the race. The dynamic between Teacher Union Activist Luedtke and Teach for America Alumnus Ferguson on Education Reform, although they are (from what I understand), quite close in the legislature, might very well make this a proxy fight between powerful labor and reformist interests (similar to the 2013 Boston Mayoral run off between Marty Walsh and Dan Connelly). Maybe former Annapolis Mayor Josh Cohen. No idea what he could raise. More than 100. . . but who knows how much more? I don’t think he’d be a particularly serious candidate, with little opportunity to expand outside of his base in the City of Annapolis (not big enough to support a real congressional bid). Nice guy, though. County Councilman Chris Trumbauer might be able to garner substantial backing in IE from the Sierra Club and the League of Conservation Voters. Which is lucky for him because he couldn’t raise more than low six figures on his own. He’d be well positioned to lock down the Anne Arundel County portions of the district (although that’s not a huge base). Bobby Zirkin a dynamic, handsome young trial lawyer who happens to be a strong contender to be the next chairman of the Senate Judicial Proceedings Committee. If that happens, his number could be as high as $1.5 million. If not, $650,000-$1,000,000. Senator Zirkin could likely raise very substantial amounts of money from the incredibly tuned in community of Trial Lawyers that finances so many Democratic Stalwarts. Dan Morhaim – a Delegate and a Doctor makes a powerful combination. Would clear a million easily. Two million might be a stretch. Shares a heavily Jewish Western Baltimore County district with Zirkin. Despite being one of the stronger fundraisers in the house, he lacks enough pizzazz to be a solid congressional contender in my opinion. Jon Cardin– Would raise a million easily, but not more than $1.2 or 1.3. Would benefit from confusion with his uncle as well. But, I think that Jon is pretty done after the AG Race. However, the Cardin brand is stronger here than it is statewide. Brooke Lierman She could raise a million bucks off her last name, and probably another 300K off of her own network. If Hoyer came in to aid his former Chief of Staff’s daughter you could see another quarter million drop in. She’d be competitive against Anne Kaiser for an Emily’s List endorsement. But as we saw with Heather Mizeur in the 2014 Gubernatorial primary they don’t devote a lot of resources to Democratic Primaries in Deep Blue states. Bill Ferguson – A handsome, white, young Baltimorean State Senator with real education reform credentials. Can he get buy in from national Ed Reform donors and raise mega millions? I’m not sure. A guy to watch, none the less. With a very, very solid base in the rapidly gentrifying, densely Democratic neighborhoods of South Baltimore. Definitely one to watch. bIn a primary this crowded, with so many disparate bases of support, I have no clue who might come out on top. I’m not going to pretend that I do. Del. Jon Cardin posted a letter to his constituents to Facebook that attacks the “negative smear campaign” regarding his attendance in the General Assembly. I guess Jon Cardin and Brian Frosh will not be having lunch together anytime soon. General Assembly records reviewed by The Baltimore Sun show that during the 90-day legislative session, Cardin missed about 120 out of 164 committee votes — nearly 75 percent. The other two legislators running for attorney general missed few or no committee votes. Rather than focus on issues or qualifications, several personal attacks were made on me. By far, the most captivating negative attack was that I was a slacker, that I had missed “75% of the votes” in the General Assembly. . . . Over my 12 years in Annapolis, no one worked harder or tried to use his powers of persuasion to get legislative leaders to see alternative perspectives more than I. I was present for both Committee and House floor votes well-over 90% of the time, the 2014 session excepted. This year, while I missed nearly no floor votes, no hearings, debates or amendments, I did miss nine committee voting sessions totaling 119 votes – all combined, less than 2 ½ hours of time. I was present for both Committee and House floor votes well-over 90% of the time, the 2014 session excepted. This year, while I missed nearly no floor votes, no hearings, debates or amendments, I did miss nine committee voting sessions totaling 119 votes – all combined, less than 2 ½ hours of time. The majority of these voting sessions occurred after 5:00pm with an unprecedented three voting sessions late on Friday afternoons when I head home to observe the Jewish Sabbath. Each evening except one I was with my wife, dealing with serious pregnancy health matters and/or my two year old daughter while my wife went to the doctor alone. Del. Cardin said further that he had never explained all of this previously but should have done so in retrospect. Indeed, serious familial responsibilities would have been a potentially effective political response to the several articles–not to mention Washington Post and Baltimore Sun editorials–highlighting his absenteeism. As a result, I am left a bit puzzled. While I can understand the desire to keep the personal private, questions raised by reporters or other candidates about your record in previous office are within the bounds of fair play in anyone’s book. 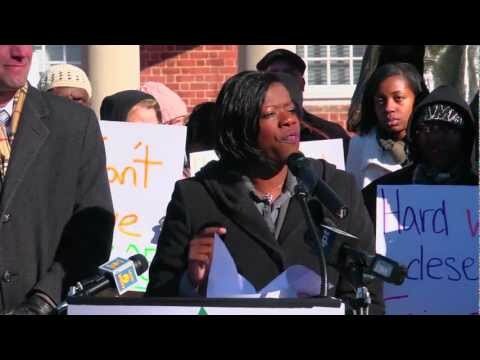 The Cardin campaign never stated that Broadwater’s article was inaccurate. Del. Cardin undermines his case when he minimizes his level of absenteeism by trying unconvincingly to convert his 2014 absence from nearly 75% of committee votes to only “2 1/2 hours of time.” Committees are key decision makers in the General Assembly and votes there can be critical. On the other hand, many will sympathize with both the toughness of campaigns (though the Cardin camp could play tough too) and the difficulties in balancing work and family responsibilities. Read the whole letter below and decide for yourself. I know that news articles (and definitely blog posts) don’t always have the whole picture. Planned Parenthood of Metropolitan Washington (PPMW) is issuing candidate ratings based on questionnaires. PPMW has given two attorney general candidates, Aisha Braveboy and Brian Frosh, ratings of 100%. Jon Cardin is not listed. One of PPMW’s questions involved support for marriage equality and Question 6, the 2012 referendum. But Del. Braveboy voted against marriage equality in the House and was not a supporter during the referendum. Did PPMW ignore the marriage equality question in tallying its candidate ratings? Was Del. Braveboy forthcoming in response to this question? Or did PPMW just make a mistake?